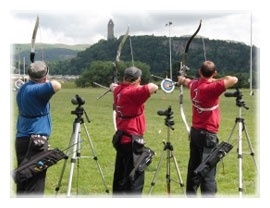 Weather conditions were variable to say the least at the Bannockburn Bowmen Open Albion and Windsors on Saturday 16th July. At least it wasn’t cold ! We had brilliant sunshine and heavy rain alternating throughout the shoot. Thanks to George B for taking charge of the whistle, to Ciaran for setting up the field and to Brenda for organising the event. To see full results click here.